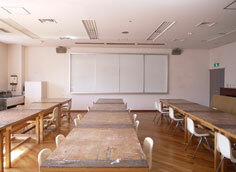 We have three exhibition rooms. We have publications including exhibition catalogues and museum goods such as postcards. Rebuild atelier of Narashige KOIDE, the oil painter living in Ashiya in the second half of 1920s. The original was built in present Kawanishi-cho area by the architect, Shinichi SASAGAWA. Furnitures and so on which KOIDE really used and often painted in his works are displayed. Café build on beautiful grass garden. After visiting museum and at the time of walking, please feel free to take a rest. KOIDE’s atelier is reconstructed at 1991 next to café. We hold various seminars related to the exhibitionｓ, symposiums in lecture room and. diverse workshopｓ throughout the year. 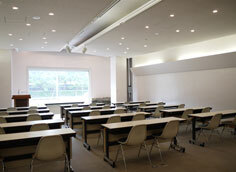 Lecture Room for conference, lecture, symposium etc. Workshop Room for workshop etc.